SMK Lutong is located in Miri, Sarawak. Our students generally come from three distinct family backgrounds. Some have parents working in oil and gas (a minority) while some other parents work in business or as civil servants (a minority as well). The vast majority of families, however, have parents working in construction and hail from the nearby Kampung Api-Api just a 5 minutes walk from the school. Most of our students are recipients of the BRIM RM100, which entails their household incomes are lower than RM2,000 per month. As a result, SMK Lutong always has difficulty in collecting money from students. For example, even with the Parent Teachers Association / Persatuan Ibu Bapa dan Guru (PTA/PIBG) member fees of RM20, our students will choose to pay by installments. Our current situation is that each Ketua Bidang, of which there are four in the whole school, has one LCD projector. For science and math teachers, we have to book the LCD projector in advance with our Ketua Bidang, Madam Noria, and return it after our lesson. This situation is not sustainable and some teachers have bought their own projectors, at their own cost, to avoid clashing. Due to our limited number of projectors, teachers have been constrained in teaching and explaining concepts such as project based research. We have had students requesting for projectors being used to teach the Model Hebat provided by the education department but we simply don’t have enough to go around. For the recently introduced KSSM syllabus, student-research-project presentations are required and having more projectors would really aid in executing this more efficiently. SMK Lutong also has 12 classes where science and maths are taught in English. LCD projectors would more effectively communicate a lot of the useful resources from the internet. 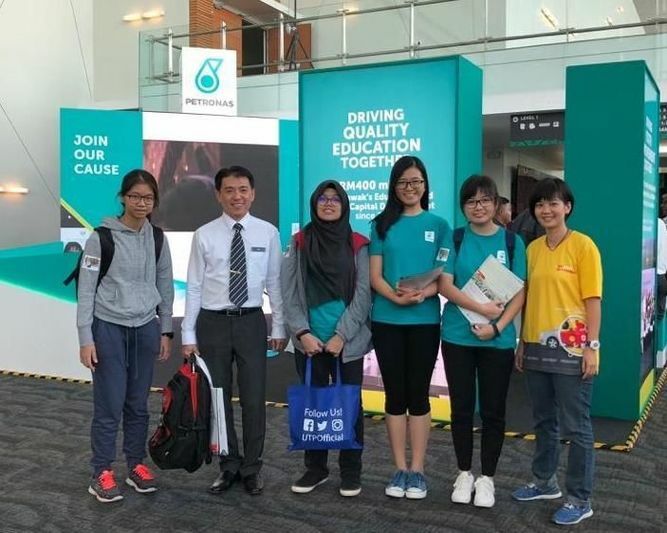 Adding to this, having more LCD projectors to share would also enable our students to better prepare themselves to participate in STEM competitions such as the Shell Innovative Competition and the Petronas Youth Enterprise. We are proud that we were able to win both at the state level and proceed to the national levels. For both, however, an LCD projector was needed for the presentation of our students’ ideas and during the project development process. Throughout the year, we also hold at least four Award ceremonies / Majlis Penyampaian Hadiah to recognise student efforts in the field of academics and co-curriculars. An LCD projector is used during the ceremony as well. With this project, we plan to have one projector available for each form from form 4 - upper 6. This will benefit 349 form 4 students (10 classes), 335 form 5 students (10 classes), 67 form 6 upper students as well as the lower 6 students who join us in June. Our future plan is to also repair the projectors in two of our junior labs, and two of our senior labs. These labs will be allocated in the teacher’s time table. Teachers can thus use the projectors there according to their teaching timetables. Upon receiving the required funding, I will immediately order the projectors online and so it will likely take a week or two at most to have the projectors available for our use. Teachers can be more engaged with the STEM programme. Students can present their idea during competitions. Science and Math research-based-study can be done on time. More information can be shared by teachers with students during lessons. We are hoping for your kind contributions to bring this project to fruition. I sincerely wish that my students can get the maximum benefit via the LCD projector.